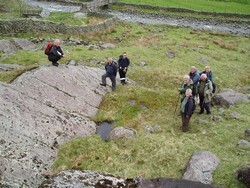 This year’s residential file trip was based at the Blencathra Field Studies Centre. This report has been compiled by Bob with input from Ian and Martin – thank you for your contributions. The trip started on Friday with a visit to the British Gypsum mine at Long Marton. We saw how the vast deposits of evaporates are quarried and transported for processing into plaster board and powder for the building industry. 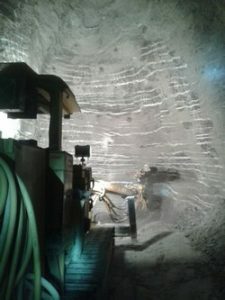 The mining method was by drilling and blasting an advancing gallery wall, removing the rock by mechanical buckets and conveyors. The roof is then profiled to form an arch, with no other support apart from pinning where galleries intersect. The gypsum was present as two main types: a dull grey rock with some impurities, seamed through by centimetre banding of higher purity white gypsum. A third type was also revealed – an attractive crystalline form of the mineral. On Friday evening, Bob gave two short presentations covering the Borrowdale Volcanics and glaciation of the Lake District. On Saturday, one of the FSC Staff providing a broader overview of Lakeland Geology. Armed with all this knowledge we travelled to the southern end of Borrowdale. We started by discussing evidence for glaciation and the impact of streams for erosion and transportation. Our ‘fossickers’ were soon digging and poking and hammering anything that looked as if it may reveal some treasure. Ian came up trumps as always finding a superb specimen of graphite, as mined in Elizabethan times. The main focus was evidence of volcanic activity and we spent some time crawling over a huge boulder that revealed evidence of wind born and water born volcanic ash deposits. We also found a good example of a volcanic bomb. The walk finished with a wonderful example of lateral or possibly terminal moraine before heading to the café. In the evening Bob gave another presentation to set the scene for more mineral hunting on Sunday before we retired to the cosy little bar in the Centre. Over to Martin: After breakfast we all left for Threlkeld Mining Museum where the rest of our party departed to visit Newlands mine. We were early and the museum was not open so we walked to the large quarry (rain had stopped for a while). 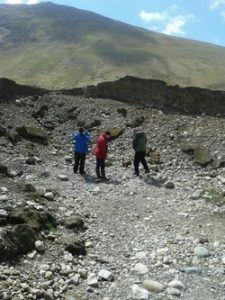 The quarry is at the junction of the Skiddaw Slates and Borrowdale Volcanics. At this junction there was a Granite Intrusion that was quarried for railway ballast and then for road stone. We were able to see various contacts of slate and volcanic rocks. The other feature of note is the great North- South Coniston fault. To the East of the fault lead, zinc, barites, iron pyrites and copper were mined. We then went off to the quarry railway and our train was nearly ready to take us to the quarry. The train staff were laid back which suited us fine. We now knew what to look for and found Micro- Granite and some contained Xenoliths. Mineral Hunting: On Sunday morning four of us visited the Goldscope mine in the Newlands Valley. This was one of the largest mines in the Lake District mainly providing Lead and Copper. We explored the main adit to inspect the geology and view any mineralisation. Some secondary copper mineralisation could be seen in the mine. In the afternoon four of us visited the Carrock mine, famous for the tungsten ores and the variety of more exotic minerals. Some time was spent looking at the old mine buildings and the mine dumps before venturing part way up Brandy Gill. Again minerals were scarce with a small amount of wolfram collected. Summarising, we covered a lot of ground in every sense of the word. Despite a poor forecast, we all had the opportunity to broaden our understanding in some very complex geological settings.